“In 1961, Ford Division Vice President and General Manager Lee Iacocca had a vision: a sporty car that would seat four people, be no more than 180 in. long, weigh less than 2500 lb, and sell for under $2500. On March 9, 1964, vision became reality as the first Mustang rolled off the assembly line. By the end of the day on April 17--the Mustang's official on-sale date--Ford had sold over 22,000 units, and the ponycar revolution was on. It remains one of America's most popular nameplates and makes a superb "first classic" and weekend playtoy. First-generation long-hood/short-deck Mustangs are available in three variations: coupe, convertible, and fastback (except '64 1/2), with wall-to-wall carpeting, front bucket seats or optional front bench seat, three-spoke steering wheel, floor-mounted shifter, and full headliner. Early powertrain choices include a 101-hp/170cid I-6, a 164-hp/260cid V-8, and a 210-hp/289cid V-8 (all '64 only and utilized a generator for charging). Later, the 120-hp/200cid I-6, a 200-hp/289cid V-8, a 225-hp/ 289cid V-8, and a four-barrel solid-lifter, 271-hp/289cid V-8 joined the fray. Throughout the run, transmission choices included three- and four-speed manuals and a Cruise-O-Matic three-speed autobox. The 1964.5 Ford Mustang - The one that started generations of die hard fans and enthusiast. In '65, the interior decor group was added (known as the pony interior), which featured special seat covers with running horses across the back, exclusive interior door panels with integral armrests and pistol-grip door handles, a five-gauge instrument panel, woodgrain steering wheel, and appliques on the instrument cluster, glovebox, and center console (if equipped). Another popular package introduced in April 1965 was the GT equipment group. Available only with the 225-hp and 271-hp V-8 engines, GT cars had five-dial instrumentation, disc brakes, larger anti-roll bars, quicker steering ratio, dual exhaust (which exited via trumpets protruding from the rear valance panel), grille-mounted foglights, GT badging, and special lower body side stripes. When it comes to American muscle/ ponycars, options are everything. 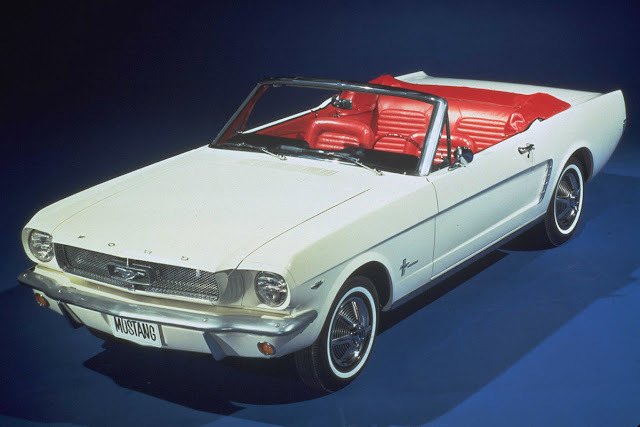 The most sought early Mustang is a Hi-Po-powered convertible, with pony interior and GT package. Concours cars can fetch upward of $30K. Fastbacks are also in high demand, while coupes with V-8 engines may be had for well under $10,000. When shopping for an early Mustang, beware of rusting door panels, putty-filled quarter panels, and "quickie" engine rebuilds. Should you find a diamond in the rough, nearly every part--either OEM or aftermarket reproduction--is still available through a host of suppliers, such as California Mustang, Dallas Mustang Parts, National Parts Depot, and Sacramento Mustang. We proudly carry New Ford Mustangs here at Brighton Ford and have a great selection for you to test drive. If you have any questions about Mustangs or any other questions in general please don’t hesitate to Contact Us. We would be happy to answer any questions you may have.